I swore I would never do television recaps again, but after last night’s Teen Mom 2 have reconsidered. I’ve found my people again. And to be clear I do not mean the cast of Teen Mom 2. To the people who have emailed me re: the Bachelor recaps: a. Thank you. b. 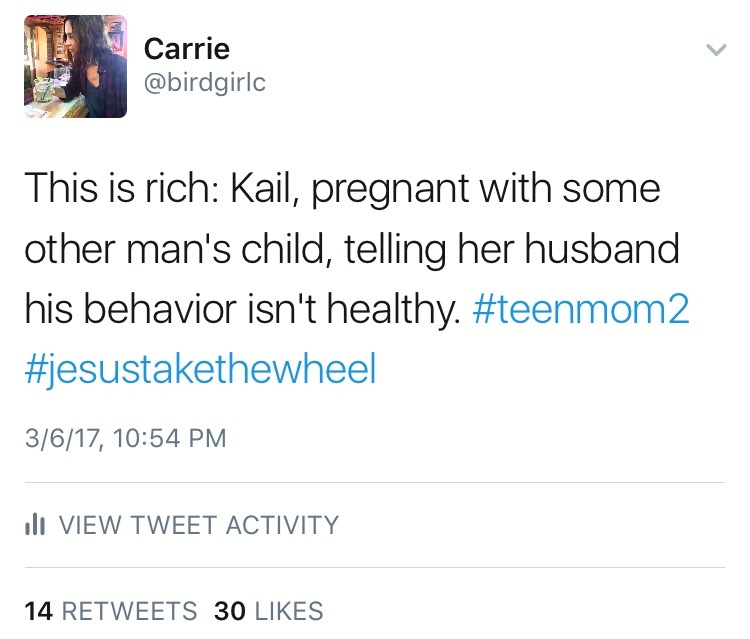 Do you watch Teen Mom 2? At least there is an element of real life to it even though after you watch you are unable to sleep because you want to go raging off into that good night, and by that I mean stay on twitter until your eyes are slits and your cat has scratched your ankle off trying to let you know it chewed a hole in the Temptations bag and threw up on the kitchen floor. Next: I started using my tumblr account (link here) after 7 years and post stuff there usually daily. Even though it’s only been a week (lolz) I love how simple and fun it is to share quick thoughts and images. I’m not giving up writing here. I have a year end recap STILL rolling around in my brain but last year was an exceptionally weird, difficult, high highs and low lows year for me. I feel like I turned a corner in my life that I can’t go back on and it’s been hard to articulate. I guess I may never fully explain it, but that essay will appear here before the end of 2017 along with some other stuff. Heck, I might even change my slider. In the meantime: Is anyone still out there? And are you watching Teen Mom 2? The recaps!! Yes!!! I don’t watch Teen Moms but if you are going to do recaps, I’m willing to start!!! Okay then, buckle up b/c I watch pretty regularly and they warrant at least a commentary. Some of the stuff on there is mind boggling.